The music of Carole King and James Taylor, I am told, is both wondrously iconic and definitive of a generation. However, as a teenager, this inherent emotional connection with the chords and soulfully penned lyrics doesn't stem from childhood recollection, as it is with my Mother, but from falling in love with the songs that seem to flow from King's heart through her hands to her piano. Rarely have I seen an artist more honest and loving. Although I was only recently introduced to the work of King and Taylor through the Broadway musical 'Beautiful', I was intrigued to see how the 'Up On The Roof Tour' would present the timeless songs and whether they would capture the essence of King and Taylor. Of course, I was pleasantly surprised. The six talented musicians we saw on stage at the wonderful Roses Theatre Tewksbury filled the space with the wholesome and heartwarming sound of King and Taylor. The vibrant singers gave a technically excellent performance in a more casual and laid back style than I may have expected, causing the audience to be able to appreciate the music relaxed and at ease. Some highlights of the performance were Emma Pryde's 'I Feel The Earth Move' where I felt the talented singer really connected with the music and Jenny Smith's 'Natural Woman' which my companion and I agree was the emotional apex of the night. It truly felt as though Smith was singing straight from the heart- a pleasure to watch. With an expert band and a brilliantly and refreshingly enthusiastic drummer, 'Up On The Roof' captured the musicality of King and Taylor with not only the necessary complexity and intricacy to perform these classic songs but a togetherness that comes only from exquisite comradery, making the performance look very natural. However, my favourite part of the night was seeing how much these musicians enjoyed performing; clearly, the songs of King and Taylor have important places in their hearts. 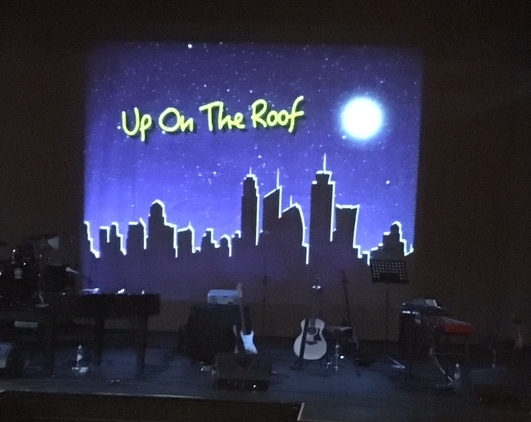 Watching the 'Up On The Roof Tour' is a wonderfully enjoyable and heartwarming experience. I recommend catching them on the rest of the tour for an evening of lovely entertainment and a fitting ode to Carole King and James Taylor.